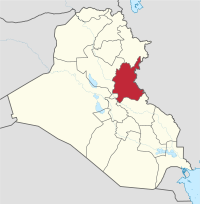 Diyala Governorate (Arabic: محافظة ديالى‎ Muḥāfaẓah Diyālā) or Diyala Province is a governorate in eastern Iraq. Diyala Governorate extends to the northeast of Baghdad as far as the Iranian border. Its capital is Baqubah. It covers an area of 17,685 square kilometres (6,828 sq mi). A large portion of the province is drained by the Diyala River, a major tributary of the Tigris. Because of its proximity to two major sources of water, Diyala's main industry is agriculture, primarily dates grown in large groves. The province also contains one of the largest olive groves in the Middle East. It is also recognized as the orange capital of the Middle East. The Hamrin Mountains pass through the governorate. The population and the ethnic composition of this province has been in a major state of flux since the Coalition invasion of 2003 and the removal of the Sunni Arab government of Saddam Hussein from Baghdad. That government and those before it, had all been Sunni Arabs and as such, supportive of the Sunni Arab interests at the expenses of all other ethnic and confessional minorities such as the Shia, Kurds and even Iraqi Turkmen. This changed drastically starting in 2003, with the Sunni Arabs becoming the ones subjected to intimidation and expulsion all over the province. Presently, an estimated population of some 1,224,000 people live in this province. Sunni Arabs, once a solid majority until 2003, have been losing their positions due to violence of the Iraqi Civil War (2006–07) and since summer of 2014, due to resurgent Ba'ath in the company of the ISIS. Nearly half the Sunni Arab population has been pushed out of the province. Presently, they constitute no more than 25 percent of the population of the Diyala Governorate. In contrast, the Feyli Kurds who were deported from this area from the 1960 to 1990s by various Sunni Arab governments in Baghdad are returning-as have other Kurds. They now dominate the entire Khanaqin district and all others bordering on Iran in this province. At the lowest point during the rule of Saddam Hussein, their numbers had fallen to just 7% of the total. Today, they boast to around 30% and increasing as they take up their old homes in places such a Jalula/Jalawla and Al-Sadiyah. The rest of the residents are Iraqi Sunni Turkmen (around 5%) predominantly in Kifri, but in smaller pockets at Jalawla, Al-Sadiyah, Miqdadiya and other smaller pockets dispersed around the province. The Diyala Province boasts the Diyala Media Center which has one of the Middle East's tallest radio and television antennas at 349 metres (1,047 ft). The Diyala Media Center was built under contract by a Japanese architectural firm in 1989. It is one of Iraq's few independent radio and television stations that offer local television and radio news coverage as well as rebroadcasting state-run television. There is evidence that Al-Qaeda in Iraq moved its base of operations from Anbar province to Diyala in 2006, and during late 2006 Baqubah and much of the Diyala province were reported to have come under Sunni insurgent control. This insurgent control is reported to have continued through 2007 and into early 2008. On May 11, 2007, Army Maj. Gen. Benjamin Mixon, commander of the Multination Division North said he needed more troops in order to contain the current level of violence in the Diyala province, this coming in the recent wake of a troop "surge", involuntary recalls by the U.S. military, and the public debate about the level of commitment from the U.S. government. By mid-2007 the Islamic State of Iraq, already holding Baqubah and most of the province under its control, declared its capital to be Baqubah. In June 2007, US forces launched Operation Arrowhead Ripper with night air assaults in Baquba. By August 19, Baquba was largely secured, although some insurgent presence remained in the city and surrounding areas. Fighting continued in the Diyala River valley but by the beginning of October, US and Iraqi forces held most of the province while the insurgents were in retreat to the north and west. On October 27 the Islamic State of Iraq attacked a police base in Baqubah, killing 28 Iraqi policemen and police recruits, showing that insurgent cells still remain in the province. In January 2008 Operation Phantom Phoenix was launched in an attempt to eradicate the remaining insurgents following the Diyala province campaign between 2006 and 2007. Mid-2008 saw many changes in Diyala province with an increased effort by U.S. Forces and a substantial Iraqi Army presence, and in the Baqubah region, Islamic State of Iraq's activity was dramatically hampered, and the Sons of Iraq program served only to further weaken Islamic State in Iraq. In December 2011, the governing council in Diyala province declared itself a semi-autonomous region within Iraq. This comes two months after Salahuddin Governorate made a similar declaration. The council in Diyala, using Article 119 of the Iraqi Constitution as justification, made the declaration because of suspicion of the Shi'a-dominated government of Prime Minister Nouri al-Maliki. Unlike Salahuddin province however, Diyala province is more ethnically and religiously mixed, and such an announcement led to the outbreak of protests in the province. ^ "Republic of iraq (IQ): Asia/Iraq/Diyala". Tageo.com. Retrieved 2007-05-28. ^ Engel, Richard (December 27, 2006). "Reporting under al-Qaida control". Blogging Baghdad: The Untold Story. MSNBC. Retrieved 2007-05-28. ^ Engel, Richard (January 17, 2007). "Dangers of the Baghdad plan". Worldblog. MSNBC. Archived from the original on November 2, 2007. Retrieved 2007-05-28. ^ "DoD Special Security Operations Briefing with Maj. Gen. Mixon from Iraq". News Transcript. U.S. Department of Defense. May 11, 2007. Retrieved 2007-05-28. ^ "Iraq's Diyala province demands semi-autonomous status". Xinhua. Retrieved 15 December 2011. ^ Hammoudi, Laith. "A second Iraqi province seeks autonomy from Baghdad". Miami Herald. Retrieved 15 December 2011.